Today is the last day of the first quarter of 2019. How are you doing on your fitness goals for the year? Are you still making progress toward those goals? Do you need to get back on the program? Now’s a great time to take a look at our wins and the things that we can do to still improve. I didn’t start with a goal of losing “X” pounds. My goal at the beginning of the year was just to get back into good shape that I can feel proud of. I’m not there yet, but I’m getting closer to that goal. I’ve either run on a treadmill, run outside, or rode my bike trainer for 80% of the days in the first quarter of the year. That’s roughly 70 more days than I spent exercising in the first quarter of last year and 100% more days than I spent exercising in the last quarter of last year. Not coincidentally, almost every pair of jeans that I own fits me again. The ones that don’t fit are from the days when I was really thin and riding my bike 250-300 miles per week. The Ed Tech Fitness Challenges that I share every Monday have helped me build some strength and flexibility elements into my exercise routine that I would have otherwise ignored. Burpees, anyone? My diet is garbage. I’ve had some good weeks, but the majority of the weeks have not been good. This is largely due to my stress-snacking habit and my habit of accepting free beer or red wine when its offered on my flights (I’ve taken 25 flights so far this year). The good weeks with my diet have been when I use the My Fitness Pal app. I need to use that every week. Just writing those sentences reminds me that I now have the metabolism of a 40 year old and not a 30 year old let alone the metabolism I had 20 years ago when I could eat two Burger King Whoppers and not gain an ounce. Just writing “eat two Burger King Whoppers” probably added an inch to my waist. For the second quarter of the year I have three fitness goals. The first is to complete a 62 mile solo bike ride in April. The second is to complete a 100 mile solo bike ride in May. The third is to use My Fitness Pal every week to track my diet. 275 of you have joined the Ed Tech Fitness weekly email newsletter in which I send out a challenge for the week. I plan to continue to send those in the second quarter. I’m thinking of hosting a Strava-like fitness challenge in the second quarter. I’m still working on the details for that (largely legal details related to hosting fitness contests). Finally, in April I’ll be recording the first episodes of the Ed Tech Fitness podcast. For one of the episodes I’ll be joined by an old friend who happens to have won a gold medal at the 1996 Olympic Games. I’m doing okay on keeping my New Year’s Resolution. In January I worked out on 23 of 31 days. In February I got in a legitimate workout on 25 of 28 days. Most of my workouts are on a bike or on a treadmill. I much prefer the bike, but I use the treadmill when I’m at a hotel just to keep the momentum going. If you fell off the New Year’s Resolution wagon, use March 1st to start again. It’s never too late to start a new, healthy habit. Try this week’s Ed Tech Fitness challenge or sign-up to try next week’s challenge. Even a short workout can have great value. Coming up with weekly Ed Tech Fitness challenges has been helpful too as I try to provide a diversity of challenges. That helps keep the daily workouts interesting. Have you tried one of the challenges? I know that Tom Richey was all over the push-up challenge. Sign-up for next week’s challenge. I owe a lot of my success in keeping my workout habit going to creating this blog and the Ed Tech Fitness Flipgrid. Just knowing that I need to do an honest check-in on the Flipgrid has kept me going on some of the days, like today, that I don’t want to workout. Now that this blog has been alive for two months, it’s time that it has a corresponding Facebook page. A few of you have asked for one to use to check-in from time to time. The new Ed Tech Fitness Facebook page can be found right here. 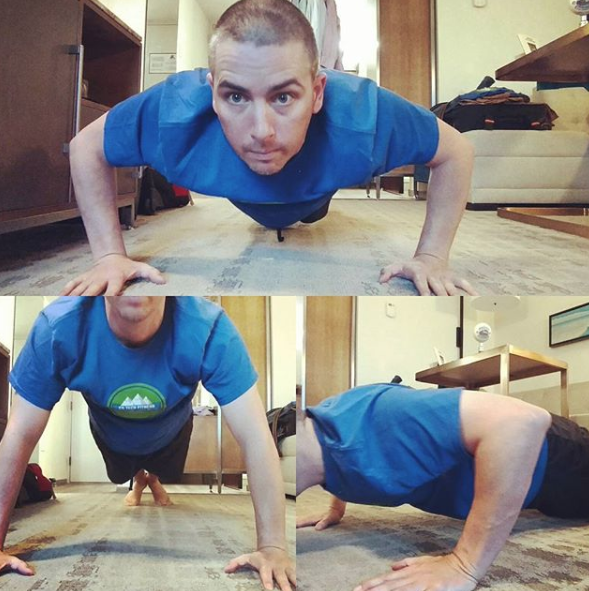 Ed Tech Fitness Challenge of the Week…Push-ups! This week’s Ed Tech Fitness Challenge might be the most challenging one so far. The challenge is to do 20 push-ups a day with perfect form. You don’t need to do them all at once. Feel free to spread them out over the course of the day in sets of 5, 10, or whatever works for you. The important thing is to use proper form. When done with proper form, a push-up will engage arm, back, chest, and abdominal muscles. This video provides an excellent overview of how to a push-up with proper form. The great thing about this video is that it also includes how to do a modified push-up with good form. The modified push-up is the way to go if you’re just starting out. As always, feel free to modify the challenge to meet your needs. If you’re already in great shape, challenge yourself with a few more push-ups per set. If you’re just getting started, maybe ten push-ups with perfect form is the goal for you. If you haven’t said hi on the Ed Tech Fitness Flipgrid, please take a minute (literally) to say hello. It’s great to hear about what other people are working on and how they’re doing. I am not a medical professional or professional fitness trainer. Please consult your physician with any questions or concerns before embarking on a new exercise or diet regimen. Complete Ed Tech Fitness challenges at your own risk.